Outlook 2016 can only connect to Exchange using AutoDiscover feature. 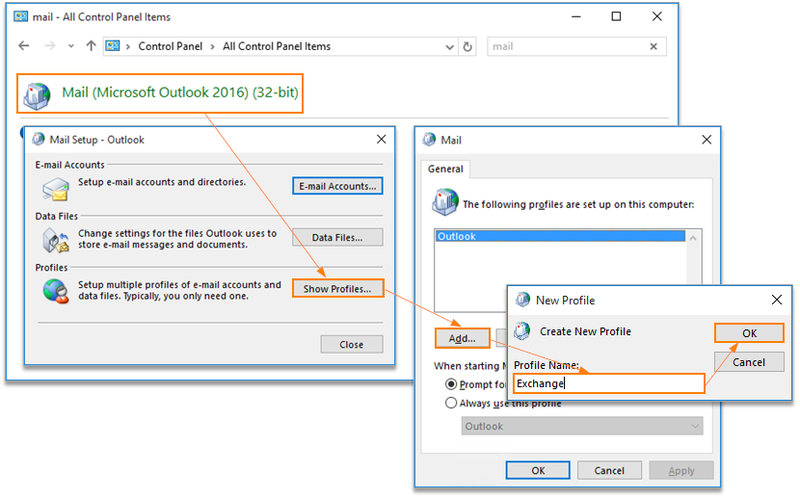 A special DNS record must be configured for your domain in order for you to take advantage of the Outlook 2016. Outlook 2016 doesn't support manual setup for Exchange accounts. Outlook 2016 does not support Exchange 2007 mailboxes. Only Exchange 2010 and later versions are supported. If you're getting an activation error 0x8007007B, close Outlook and all other Office applications and use the Repair option under Control Panel > Programs and Features > your Office / Outlook installation > Change. Known issue: if you're experiencing issues connecting to Resource Mailboxes after upgrading your existing profile to Outlook 2016, delete the .ost file and re-create it. Known issue: sometimes Outlook 2016 takes too long to discover the mailbox settings. This issue can be fixed by making changes to the registry. Important: Back up the registry first and be careful when making any changes to it as any incorrect action may result in the OS crash. 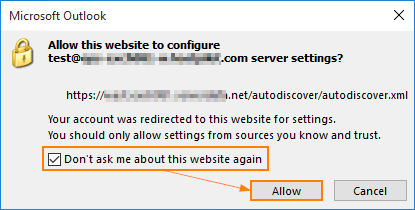 Note: you may need to create AutoDiscover sub-key if it doesn't exist under Outlook key. 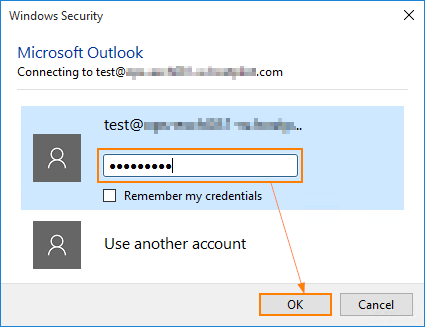 Adding this entry will force Outlook to skip one of the checks it performs when discovering the settings and proceed to the next step when Outlook client gets the mailbox settings from Intermedia servers. Navigate to Windows Control Panel > Mail > Show Profiles > Add. Specify your Profile Name and click OK.
On the Auto Account Setup page type your name, primary email address, and your mailbox password twice, then click Next. Read the Knowledge Base article on What Is My Username And Primary Email Address For My Exchange Mailbox? for more information. 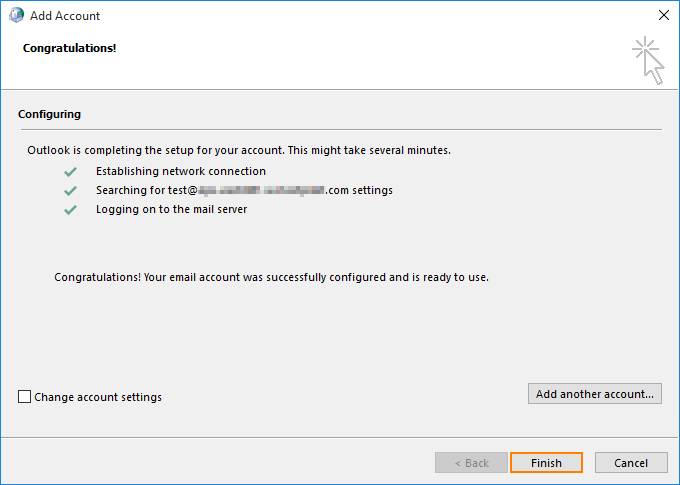 Outlook 2016 will start configuring your account. When you get a security prompt, check the box Don’t ask me about this website againand then click Allow. 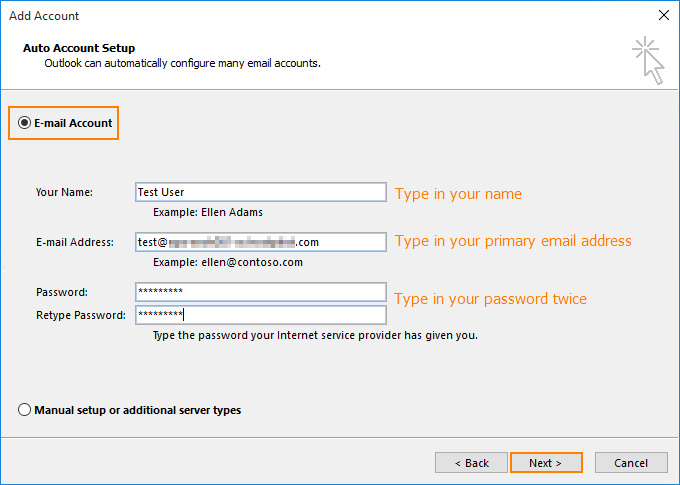 Outlook 2016 will discover your email server settings and finish configuration of your email account. Once you see all steps as completed, you can click Finish. Now you can open your new profile in Outlook 2016.